One of the early tasks I need to do with Cranbrook is assess what rolling stock has been included, and how much work needs doing to it. First impression is – there is a lot, the vast majority scratchbuilt. 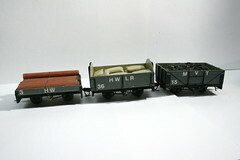 Most numerous are four wheel open wagons of various types, those pictured above are only a sample. They tend to use OO kit underframes, Ratio and the like, and several have sustained damage either through wear or fatigue to the axleboxes. 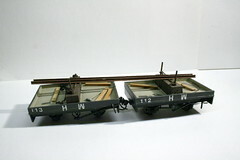 These will need to be replaced, perhaps with the Peco O16.5 kits I discovered were suitable for my 5.5mm scale vans – they have the advantage of being cheap at least. However there are enough in working order for now so this can be an “as and when” kind of operation. The closed vans are in a better state. 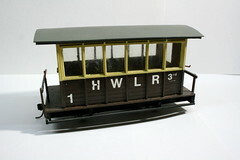 A couple of brake vans seem quite heavily influenced by those from the Welshpool & Llanfair, at least in their later condition, and suit the character of the line. 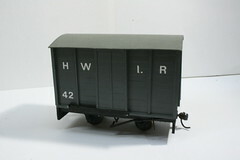 There is also a big bogie van which looks great, but wobbles like a drunkard on it’s Ratio diamond frame bogies so that will be one of the first to get some attention. 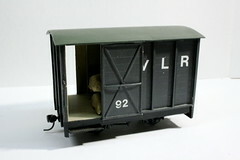 But perhaps the jewel here is the rake of livestock vans, which were too long for my makeshift photography studio! They are right at home being shunted around the station and thoughts are turning to providing a cattle dock for them on one of the sidings. 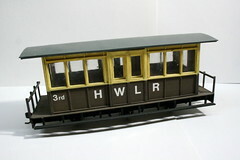 Turning to coaching stock, the HWLR has chosen a chocolate and cream livery for its balcony-ended carriages. 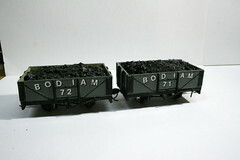 The two bogie coaches run well and take up almost an entire fiddle yard cassette on their own, leaving the two smaller ones perhaps a little superfluous. 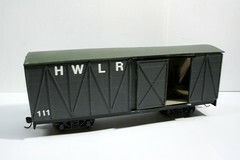 The 6-wheeler, however, has a correctly articulated underframe on the Cleminson principle. Finally, pretty much the only kit in the collection. 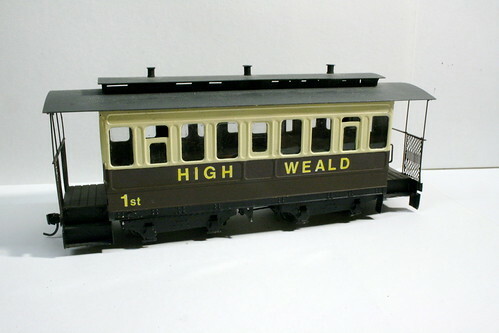 This is, I think, a Branchlines etched brass kit for a Clogher Valley Railway (Irish 3′) coach and is a beautiful product beautifully assembled. It has clearly been designed to allow for correct, 21mm, gauge but the CVR loading gauge was small enough that it doesn’t look out of place. 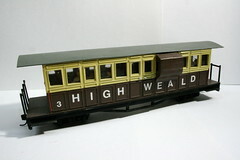 Sorting through Cranbrook’s rolling stock it is increasingly clear that I landed a pretty good deal. There is more here than is really needed for a typical operating session, and I think I will be able to restore and supplement the working stuff at my leisure. Through operating the layout a little I’m also getting a handle on the best shunting moves and where wagons need to be placed. 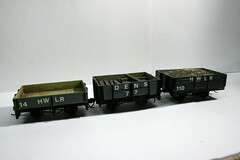 Perhaps another early task should be to establish a “switch list”, so a randomly formed goods train can be shunted with some purpose. 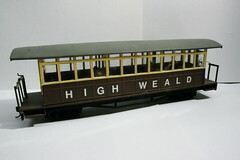 This entry was posted in cranbrook, model railways, narrow gauge, O16.5, scratchbuilt. Bookmark the permalink.